Here's a new publicity still of Dwayne Johnson as Hercules from HERCULES ; it used to be called HERCULES : THE THRACIAN WARS but apparently the title was changed to HERCULES. Looks good. That's one big chariot though. Last Friday I posted a photo from the Kellan Lutz version of HERCULES : THE LEGEND BEGINS. This looks better but like the Kellan Lutz film, this film doesn't really follow the myth of Hercules. 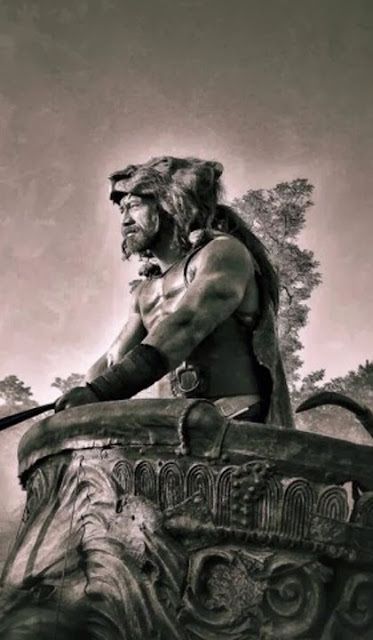 I saw the previews for the first film with Mr. Lutz, and now I see this, so I guess that they are writing Hercules as if he were either Conan or a successful gladiator in Rome? Was the original legend such a bad plot to use?